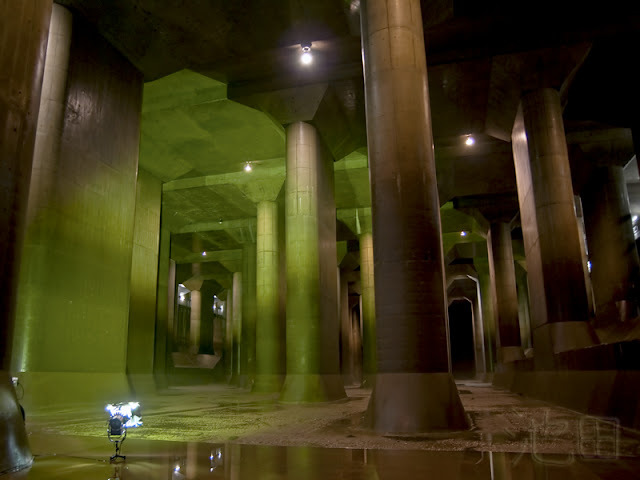 Last Thursday we drove to Kasukabe City to tour the Greater Metropolitan Area water discharge tunnel, or rather - a huge surge tank, which is part of the Tokyo Metro Area flood prevention system. Complicated? Only a little. I'll explain it all later. Dr T already posted his trip summary on his blog. Now it's my turn. 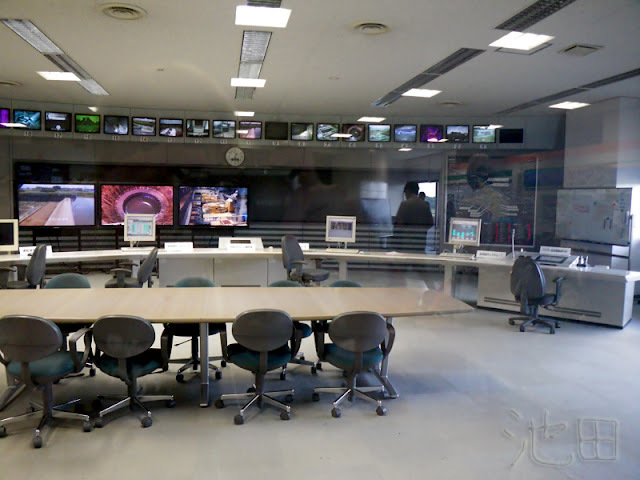 Before we could take the tour, we had to somehow get to Saitama (that's where Kasukabe City is). And we got there by driving. Even that part of the trip was very exciting for me. My first time in Saitama! Yay! Up until now, the farthest south we had ever driven was to Sano, to the outlet mall. And now, a drive all the way to Saitama! How cool, I thought. I changed my mind as soon as we left the highway - we got stuck in a massive jam. Dr T, who once upon a time, a century ago, lived in that area for a couple of years, claimed it had always been like that. Endless jams. Endless traffic. Endless hell. I was missing Tochigi already. 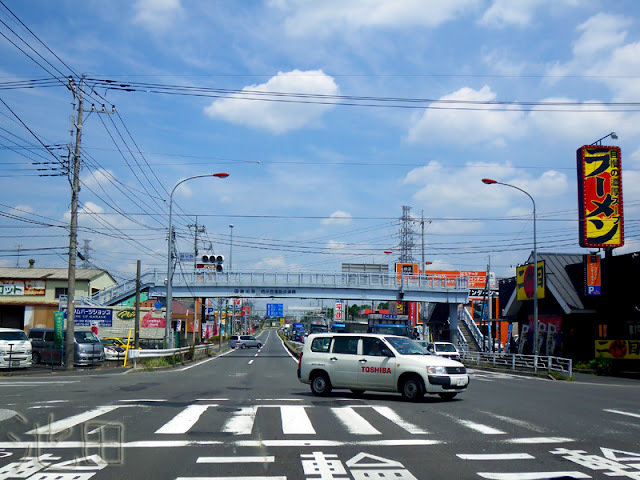 We stupidly believed our car navigation system and let ourselves be led right through the center of Kasukabe City. 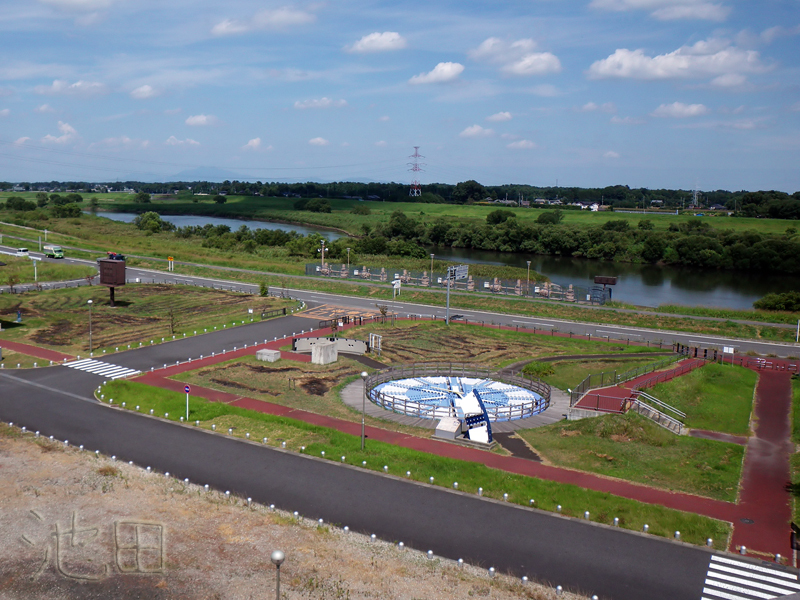 That was when I was not just merely missing Tochigi, but hating Saitama. 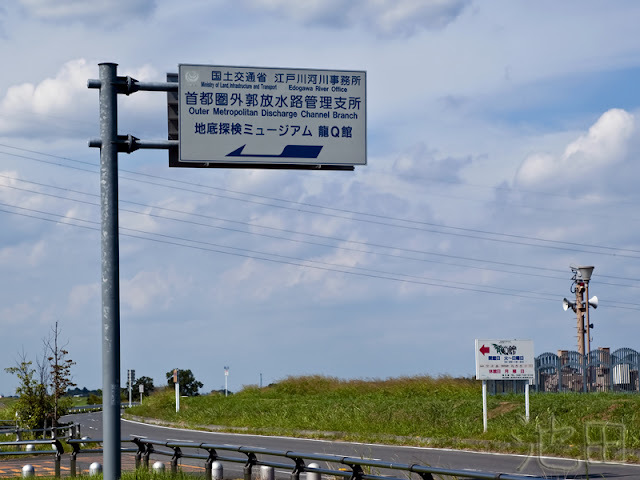 The only redeeming feature of that prefecture? Its drivers. They actually stop, flash their lights and let you make a right turn. Happened to us three times in as many minutes. Amazing. And unheard of in Tochigi. Here instead of stopping, flashing the lights and letting you go, it's common to speed up, lean on the steering wheel, honk and scare the living crap out of you. All of that happening while the light is changing from yellow to red, leaving you stuck right in the middle of the intersection like a stupid idiot. That's Tochigi driving for you. No wonder we lead the nation in fatal road accidents. But hey, we gotta be good at something, even if it's vehicular homicide, right? Right. 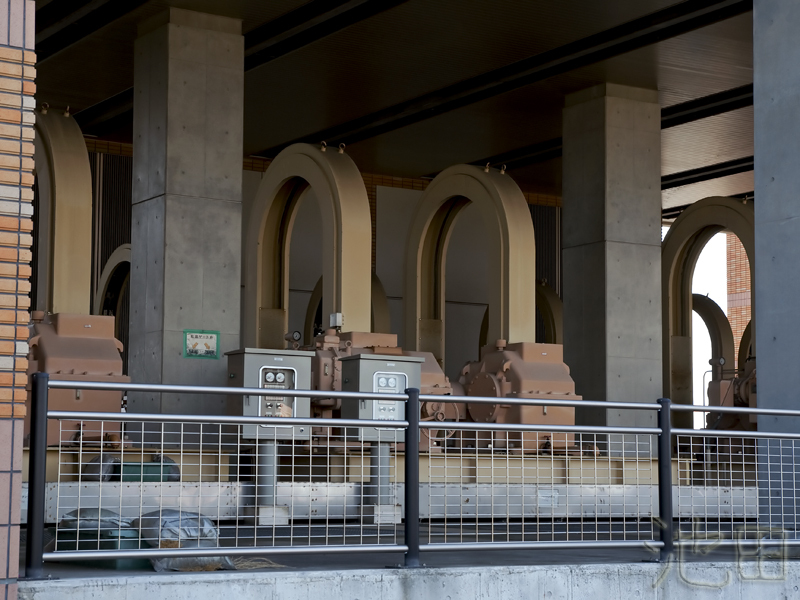 Finding the drainage pump station is easy. It's clearly marked and judging by the line of taxis delivering other tour participants, it's must be quite well known in the city. We simply followed the signs. The tour has to be booked online and you need to be there 30 minutes before the starting time to register yourself, collect your badge and watch a mind bogglingly dumb anime about the whole flood prevention system. Because the whole tour is conducted in Japanese and you need to be able to follow safety/ emergency instructions in Japanese, you either need to understand the language, or be with someone who does. Or simply nod and say "hai" and "eeeeeehhhh!" or "ah soooooo!" to everything the guide says. It works just fine. You also need to wear sturdy shoes and be able to climb up and down a whole lot of steps, which can be wet and/ or muddy and very slippery. But before you can do that, you are going to listen to a very informative lecture on how the greater metro area flood prevention system works. If you come early, you can even watch a proper movie. In English. I quite enjoyed that part, actually. The whole system consists of 5 intake banks, a huge underground tunnel, a humongous surge tank and a pump station that pumps all this excess water to the Edo river. So, basically, they build a river and a dam underground. 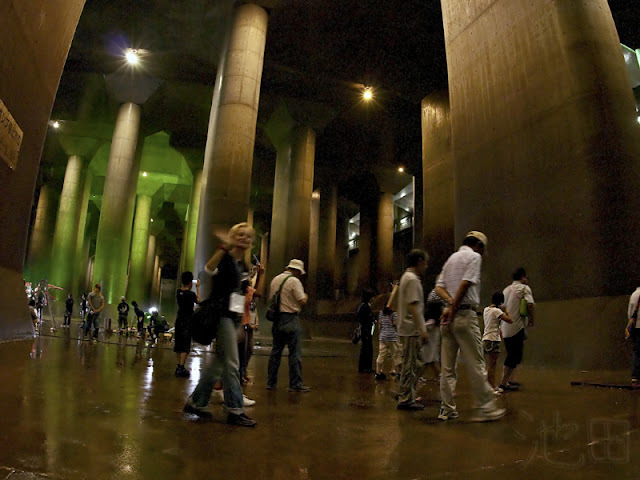 When it rains and local rivers overflow, this overflow is collected 50 meters underground, it fills the surge tank and then is spat back to a larger river 6.3 kilometers away. Don't ask me what happens during a major earthquake. I don't want to know. 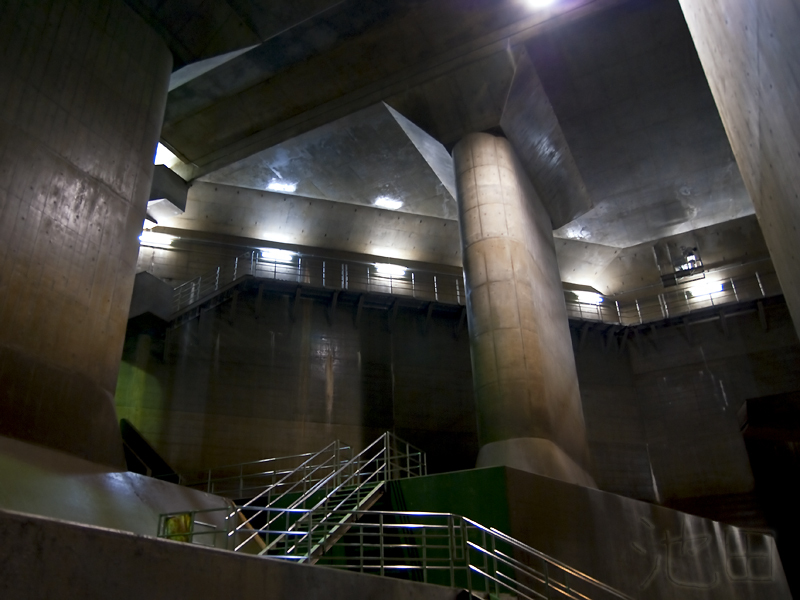 The fun part is, of course, when you get to visit the surge tank. It does look like an underground temple. Or, as the English language brochure described it - as an underground Parthenon-like structure. The steps were not as bad as I thought. Yes, they were wet and slippery, but nothing like what I thought it was going to be. It was an easy climb up and down. Or rather - down and up again. 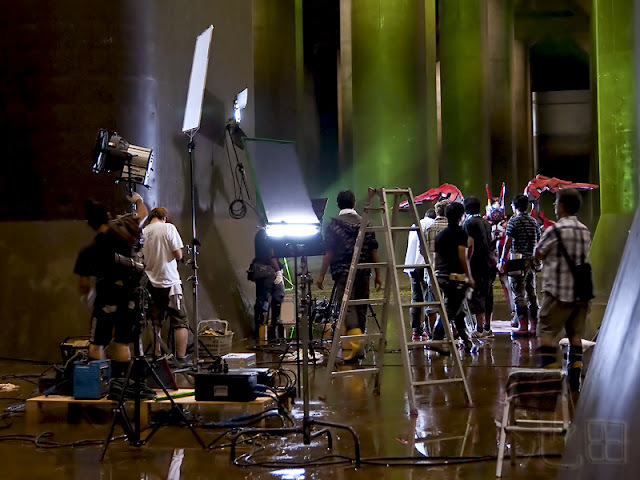 When we were there, the space was occupied by a film crew filming some dreadful live action anime hybrid. They didn't want us to take any photos of them, but their orders were universally ignored by everybody in our group. The whole tour, from beginning to end, lasts only 90 minutes, of which just 15 are spent underground in the surge tank. And there's no tour on days when it rains and the tank is filled. When you leave you get a free postcard and you can roam the grounds more or less freely and take photos. I didn't see one guard or a single security person. All in all, an interesting way to spend a free afternoon. However, I don't recommend this tour for kids - they'll be bored out of their minds, misbehave and only frustrate the guide. And embarrass their parents. And piss off other tour participants. Trust me, I know what I'm talking about. There was a bunch of elementary school kids in our group. More info here (in Japanese).